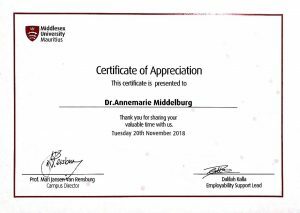 The 20th of November 2018, I gave a guest lecture at Middlesex University Mauritius. I was invited to speak about my experiences working as a freelance consultant in the field of human rights. The aim was to give law students, both at the bachelor and master level, examples of the many diverse employment possibilities in the legal field. During the lecture, I shared with students – who came from different countries in Africa – my personal experiences, including the decisions I made in the past 10 years in relation to my career. I started the journey when I was a bachelor student International and European Law at Tilburg University in the Netherlands. I explained why I choose this bachelor programme and how I came to the decision to enroll for the Master International Public Law with a focus on Human Rights Law. 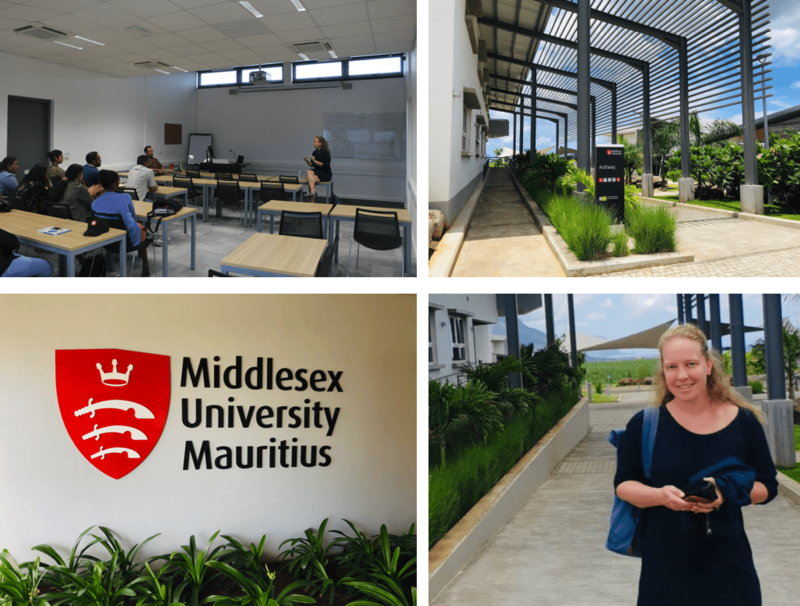 Students explained that they had followed some courses on human rights law, but in relation to Master Programmes, the only option they have at Middlesex University Mauritius is to enroll in the Master International Business Law. Nevertheless, they were very much interested in human rights law. After shortly addressing my student life, I focused on the four years at Tilburg Law School at Tilburg University working on my PhD thesis. I told the students at the start of my lecture that they could ask me anything, and I was happy to see that they didn’t hesitate to do that. After I explained the topic of my PhD research, one of the students carefully asked me: “How did you – as a white woman living in a country where the practice does not originate – come to write about the practice Female Genital Mutilation?” I absolutely enjoy to answer these type of questions. I shared with the students my passion for girls’ and women’s rights and my personal commitment in relation to making a difference for gils and women that are suffering from different types of violence. Then I continued with my decision to found my own business. I explained the students that I was – already during my PhD trajectory – invited by the UN to come to New York to present my research and ideas about the connection between human rights and harmful practices, which led to a publication, together with UNFPA and Fordham University. After I completed my PhD thesis, I decided to go on a world trip with my husband. We both quitted our jobs and traveled the world for one year. When we came back to the Netherlands, I decided not to look for a job, but to fully devote my time in my own business. Students asked many questions, like: “But how did you ensure you had an income from the very beginning? Wasn’t it scary to just start it? How did you know that this would be the right choice? Was your business successful from the very beginning? How did you get your first clients? How do you determine your rates? Is your rate the same for the UN compared to NGOs? Do you also do pro-bono work? How does that work?” The students were really eager to understand how I made my business work, and I really enjoyed answering all their questions.